Trolley Speaker for Karaoke exudes a strong musical texture. In terms of appearance, simple and retro style, superb craftsmanship highlights individuality. The 10-inch trolley speaker is well protected in terms of sound quality, because the built-in mid-high speaker design is more delicate and clear in sound quality. 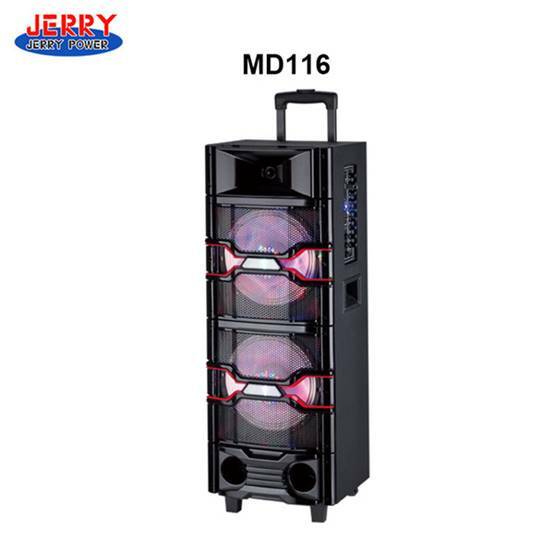 This Trolley Speaker for Karaoke bringing more power and sound to your party or event. This motivity party speaker includes wireless microphone and remoter control. When you hear the high quality battery speaker, immediately you will think of quality built, affordable Bluetooth Speaker systems. Trolley Speaker for Karaoke exudes a strong musical texture. In terms of appearance, simple and retro style, superb craftsmanship highlights individuality. The 10-inch trolley speaker is well protected in terms of sound quality, because the built-in mid-high speaker design is more delicate and clear in sound quality. And it also supports a variety of sound source playback, convenient and fast. Our Bluetooth speaker transmissions offer a wide range of stability, low latency and low power consumption. It is dust and water resistant, so these speakers can work in harsh environments. 1. It has a high and low frequency two-way unit horn, and the tweeter uses a full-length stroke horn treble. 2. User-friendly levers are convenient for users of different heights. 3. Two-way heat removal system can effectively protect the safety of the speaker. 4. The outside of the wheel is made of high quality plastic, and the center axle is made of high quality steel. So it reduces friction and allows the wheels to turn faster. 5. The sturdy iron alloy mesh cover can effectively protect the internal speakers.